The HP Envy 13 is an ultra-slim laptop that still features full-sized USB ports and even discrete graphics options, all while being thinner than the MacBook Pro. We have a love/hate relationship with ultra-thin laptops. On one hand, Ultrabooks have never been thinner and lighter, but to get there they’ve sacrificed clickable trackpads and decent key travel. And don’t even get us started about every slim notebook going USB-C only, forcing us to carry a bundle of dongles. 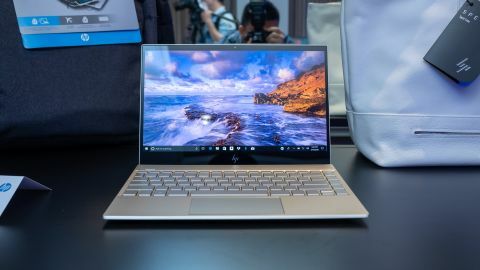 When HP unveiled an even thinner Envy 13, our eyes rolled immediately, as we expected to get the same 'all USB-C spiel.' But to our amazement, this 13-inch notebook features two full-sized USB ports and even optional discrete Nvidia MX150 graphics, despite measuring just over half an inch thick. The HP Envy 13 will be available later this month starting at $999 (about £740, AU$1,320). For this price, the 13-inch laptop comes equipped with an Intel Kaby Lake Refresh Core i7-8550U processor, 13-inch Full HD (1920 x 1080) screen, 8GB of DDR3 RAM and 256GB SSD. HP has said the Envy 13 can be equipped with optional MX150 graphics, but the company has yet to release pricing information for this upgrade. There’s also no word on how much adding a sharper 4K screen, larger storage drives or more memory will cost. By far the coolest feature of the HP Envy 13 are the new drop down USB-A ports. There’s one located on both the left and right side of the notebook, and they don’t look like any existing port at first glance, but they have a little lower panel that flips down to reveal the full-sized connector. Sure, it’s a bit of a gimmick, but we haven't seen another laptop manufacturer pull it off, despite the fact that it basically uses the same mechanism as drop-down Ethernet ports on Ultrabooks and other thin laptops. Measuring 0.59 inches (1.49 cm) thick, the HP Envy 13 is as thin as a MacBook Pro. What’s more, this laptop is also a few ounces (or grams) lighter than Apple’s 3.02 pound (1.37 kg) flagship laptop, weighing in at just 2.9 pounds (1.32kg). Despite these similarities, the HP Envy 13 feels like a much better-equipped laptop thanks to its 13-inch touchscreen, while maintaining all the creature comforts of a tactile keyboard and trackpad that actually still clicks. The HP Envy 13 also features a drastically overhauled geometric styling. Almost all the lines on this laptop are completely straight, and join together to create sharp shapes. Nowhere is this more apparent than the geometric speaker grille, which looks like a pattern of dot matrix triangles. What HP really wants you to take notice of is the Damascus steel pattern on the back of the laptop hinge. However, you really have to look for it, as it only shows up on a small strip on this notebook’s backside, so it’s easily missed. It’s also easy to overlook the fingerprint scanner built into the right side of this laptop, but it should come in handy for quick Windows Hello logins. As with the three previous iterations of the Envy series, the Envy 13 includes a lifting hinge that raises and pitches the keyboard base at a slight angle for a more comfortable typing position. The Envy 13 might not be part of HP’s flagship Spectre line, but it basically should be. Equipped with a quad-core Intel Core i7-8550U processor and optional Nvidia MX150 graphics, it should be even more powerful than both the Spectre 13 and Spectre x360. That said, HP’s decision to go with DDR3 memory means this laptop won’t be able to take full advantage of the speed of its core components, although it utilizes PCIe NVMe storage to ensure fast boot times and program launching. The HP Envy 13 is one handsome-looking laptop that’s going to give the MacBook Pro some tough competition. Not only is this 13-inch notebook poised to be better equipped, it could give those tired of the dongle life a perfect Windows 10 alternative to jump ship to. We’re not crazy about the lack of DDR4 memory but this could be a forthcoming configuration option. Until we see any such an option, and get the chance to test this would-be Ultrabook powerhouse, we’ll reserve final judgement for a later date.